PWS&D works with Canadian Foodgrains Bank to help refugees access enough nutritious food as they wait for peace and the opportunity to return home. Please pray for those enduring the uncertainty and trauma of displacement, and consider making a donation that will lead to critical, life-saving assistance. 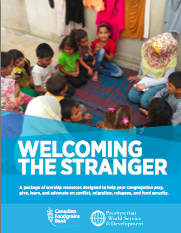 The resources in this package will call your church into a time of thoughtful prayer while engaging youth and adults to learn about conflict, migration, refugees and food security.